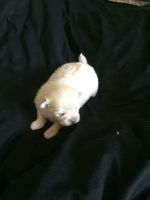 Pomeranian breeders links and breed information on pups4sale.com.au. History – It is believed that the Pomeranian (or the Pom, or Pom-Pom) originated in the Pomeranian region of what is today Germany and Poland, though the exact year is unclear. They were definitely bred from the larger German Spitz and other Spitz-type dogs, and the origin of those dogs goes back to ancient times. Early Pomeranians were said to have weighed upwards of 30 pounds, which is a great deal heavier than current acceptable weights of this toy breed (1.5-3kg/3.3-6.6lbs). These larger Poms worked mainly as sheep herders, and they were prized as such. As the years passed and breeders continued to refine the breed, the overall size and weight was reduced dramatically. Their use changed as well. In the 1700s and 1800s, the Pom-Pom became more of a lap dog, companion, circus performer (as they were agile and adept at performing tricks), and watchdog than an actual working dog…which suited fans of the breed at the time (Marie Antoinette, Mozart, and Queen Victoria, just to name a few), and in 1870, the Kennel Club of England officially recognized the Pomeranian. Queen Victoria’s Pom was named Marco, and came as a gift from her trip to Florence, Italy. History continued - Thanks to the Queen’s popularity and her extreme love of her little Marco, the Pomeranian breed experienced quite a boom in 1800s England! In fact, the Queen also played a large role in the sizing-down of the dog, which increased the popularity even more. In 1888, the Pomeranian was first recognized by the AKC, but until 1892, they fell into the “Miscellaneous Class” of Toy dogs (actual classification came in 1900). The breed continued its rise and in 1911, the American Pomeranian Club held its first specialty show in the Waldorf Astoria Hotel in New York City. The Poms of that showing were still not as small as the ones we know today; these were heavier in bone, had larger ears, more “fox-like” faces, and weighed, on average, 6 pounds. The coat, too, was slightly different, lacking the bountiful amount and denseness of today. It also appeared in colors like black, brown, cinnamon, and cream (whereas now we mostly see the orange/rust color). The Pomeranian’s compact size, easy nature, sturdiness, and spirit have firmly rooted a love of the breed in hearts everywhere. In fact, they consistently rank at or near 15th in most popular breeds according to the AKC. Not bad for a little pooch from outside Lichtenberg! 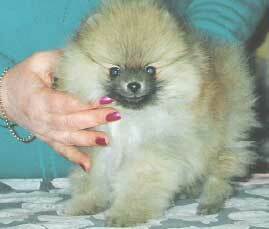 Breed Standards – In terms of breed standards, today’s Pomeranian is rooted firmly in the Toy class. The average height runs between 7 - 12 inches (18 - 30 cm), with an average weight between 3 - 7 pounds (1 - 3 kg). The Pomeranian has a thick, double coat, the outer layer of which is long, straight, and roughly textured, while the undercoat is soft, very dense, and very short (helping to provide the super fluffy appearance of the pup). As for coat colors, it comes in a variety of colors including red, black, white, orange, cream, blue, and brown. Other colorings/patterns include black and tan, brindle, wolf sable, orange sable, and parti-color (white with colored markings). Other characteristics include a wedge-shaped head in good proportion to the body, a short muzzle, dark almond-shaped eyes, small, erect ears set high on the head, and a quirky little feathered tail that lies flat over the back. The color of the nose can often vary depending on coat color, and dewclaws can sometimes removed. For any other specifics, you can also contact your local Pomeranian breeder. Energy – The tiny Pomeranian does not require a great deal of exercise, which makes it an ideal pet for those who live in apartments or small homes. A daily walk and a healthy dose of play should be sufficient to keep your Pom happy. These are happy dogs, athletic, and love to participate in dog sports like agility, fly ball, obedience, and tracking. 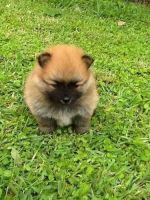 But another good reason to keep your Pom-Pom’s mind and body active is that it will help to reduce the likelihood of developing “Small Dog Syndrome,” which usually shows itself in excessive barking, separation anxiety, and other destructive behaviors. 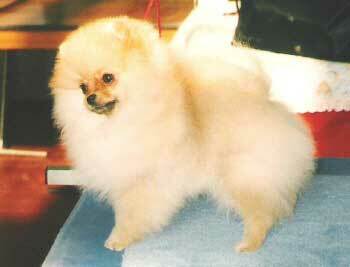 Temperament – The Pomeranian is basically a small dog who has no idea it’s not a Great Dane. They are outgoing and bold, clever and dynamic. Poms definitely have an alert and inquisitive nature with a tendency to not be fearful or wary of strangers…all of which lends itself to the Pom’s reputation as a stellar watchdog. This little, fluffy dog is a lion at heart, and it has every intention of protecting you and its family. Overall, the Pomeranian makes an excellent companion. They can just as easily sit and cuddle as they can boldly explore the backyard all alone. But one of the most frequent complaints about this breed is their tendency to bark… a lot. While very intelligent, they are quite stubborn. That said, they may fight back on training attempts. 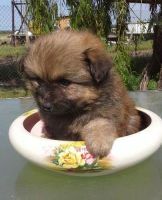 They also can be a bit stubborn when it comes to housebreaking…Poms are not fans of going potty outside when it’s cold or wet, so paper training is a good option. But, as with any pet training, consistency and a firm (but gentle) hand will usually win out. Though they may think they are giants of the dog world, Pomeranians look like little dolls, and they are somewhat delicate. The breed is therefore not recommended for young children or rough play of any sort. Other dogs and household pets can make fast friends with the Pom, but early socialization is recommended. At the end of the day though, Pom-Poms seem to prefer to have adults as their pack mates. Keep in mind that the Pomeranian, as with most small dogs (especially the smart, stubborn ones), can develop Small Dog Syndrome if exercise and training are neglected. This breed is not afraid to voice its displeasure at being mishandled, and it also has no problem whatsoever in using its adorable looks to succeed in being spoiled rotten. If you do not establish yourself as a strong pack leader, this tiny pup will happily walk all over you, and those behavioral problems will magnify themselves ten-fold! So, do yourself and your adorable furry friend a favor: socialize early, train consistently, and exercise daily. Those three simple things will ensure that your Pomeranian will be the canine love of your life! 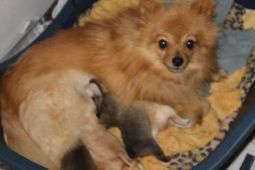 Health – Pomeranians have a good life span…14-17 years. But, as with so many other breeds, they are prone to genetic conditions including dislocated kneecaps, heart problems, eye infections, skin irritations, and tooth decay. Dry food and crunchy bones are recommended to help keep gums and teeth healthy and free from tartar build-up. There are additional problems that can occur with merle colored dogs. They are prone to deafness and mild to severe eye problems. Merle dogs whose parents are also merles may suffer additional issues of skeletal abnormalities, cardiac abnormalities, and problems with reproductive systems. Pomeranians also suffer from skin and fur issues. One of the most common names for this disorder, “black skin disease," is a combination of hair loss and a darkening of the skin. This condition can be inherited, it can occur at any age, and males are affected more often than females. Grooming – Unfortunately, the Pomeranian is a shedder. The double coat needs to be brushed frequently, which can be a time-intensive task (though not very difficult). Bathe only when necessary, but a dry shampoo can be used more often. Be careful to clean your Pom’s eyes and ears every day or two, and because of the risk of dental issues, daily brushing and regular checkups are recommended. 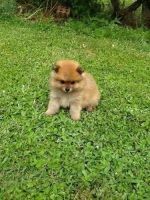 Your local Pomeranian breeder can provide even more guidelines, tips, and tricks in caring for your beloved Pomeranian. Negatives – The Pomeranian has the expected grooming requirements for dog with such a larger-than-life coat. 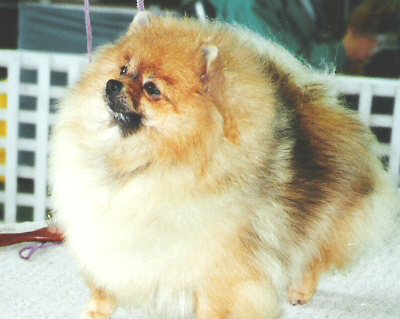 There are genetic health problems to monitor for, and as with most small breeds, the Pom is prone to Small Dog Syndrome. Training can be challenging, and excessive barking has been reported. 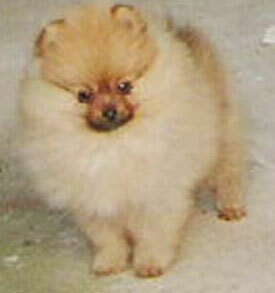 Positives – If you are looking for a tiny, spirited, bold, loving, loyal companion, the Pomeranian fits the bill. They are ten times the dog, in one small little body, and their antics are always good for a laugh! Happy to cuddle, yet excellent watchdogs determined to protect the pack, this amazing decedent of the mighty German Spitz most certainly would make its ancestors proud at the manner in which they’ve continued the line!